...there are many recipes are a must-to-make on this day - various kinds of pongals, desserts and appetizers for potlucks are just to name a few. 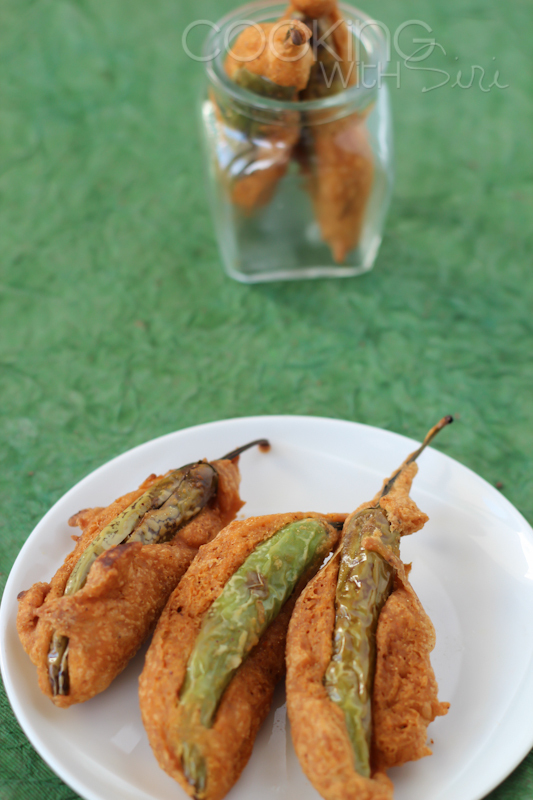 Mirchi Bhajji, as-is is the best snack ever..
To add to the list is today's recipe - Cut Mirchi Bhajji a.k.a Double Fried Cut Chilli Fritters which are just perfect for any occasion, not just festivals. Choosing the right kind of peppers is important for bhajji to come perfect! 1. Wash and pat dry peppers. Make a vertical slit to the peppers and remove the seeds and membranes. 2. Fill peppers with little stuffing**. 3. Heat sufficient oil in a wok for deep-frying on medium-low heat. While it gets heated up, lets prepare the besan coating. 4. In a bowl, mix besan, rice flour, chilli powder, salt and eating soda. Add water little by little (without any lumps). Note: To a consistency where it doesn't drip easily and coats the peppers completely. 5. Once the oil is heated (Make sure the oil is NOT smoking hot. 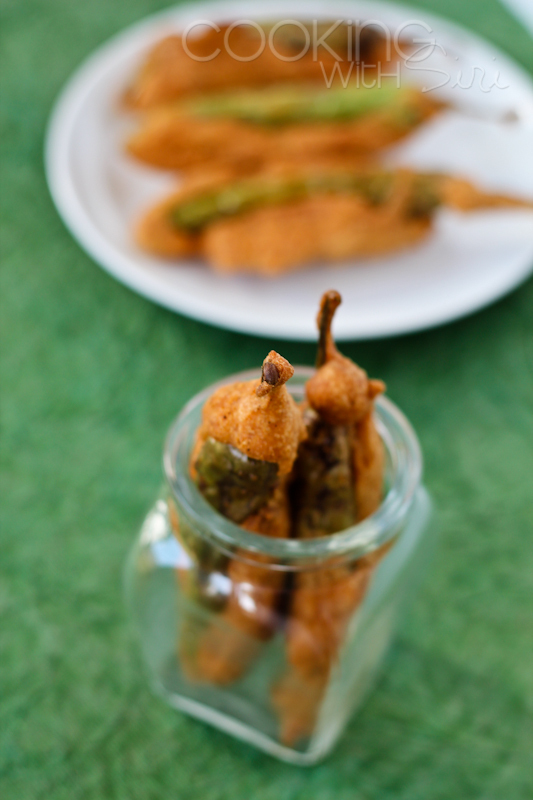 ), dip each of the peppers into the besan paste. 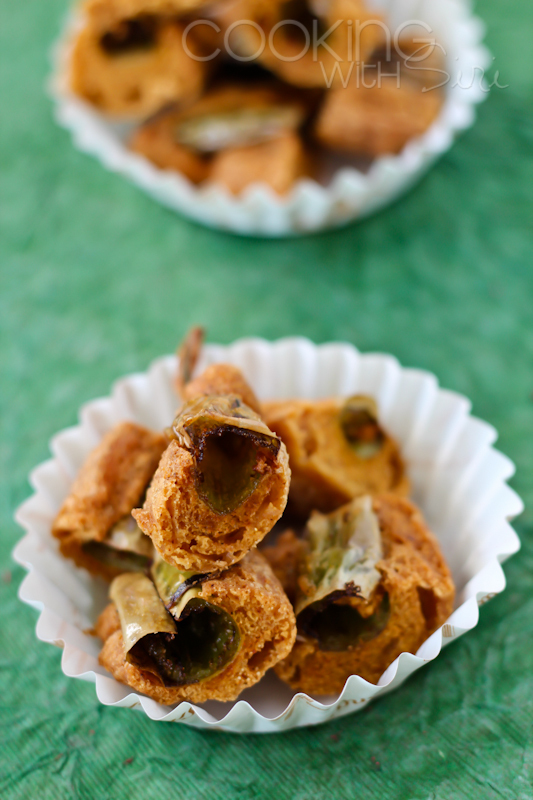 With one finger slide off the paste on one side of the mirchi, so that it cooks completely. (one nifty trick my mom learnt from a street vendor ;-) ). 6. Deep fry the peppers to a golden brown color. Drain them on to paper towel so that excess oil is drained off. Cool to room temperature. stop your urge to polish them off, we have just one more step to go ;-). 7. 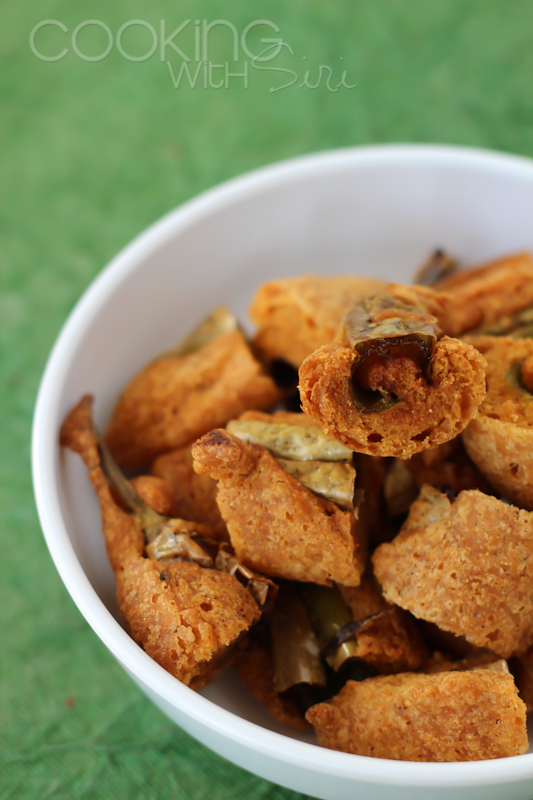 Cut each of fried peppers into 1 inch long pieces. Deep fry them again in medium hot oil until they turn crispy which will take only a minute. Drain them again on paper towels. 8. Serve with finely chopped onion, cilantro and lemon slices. 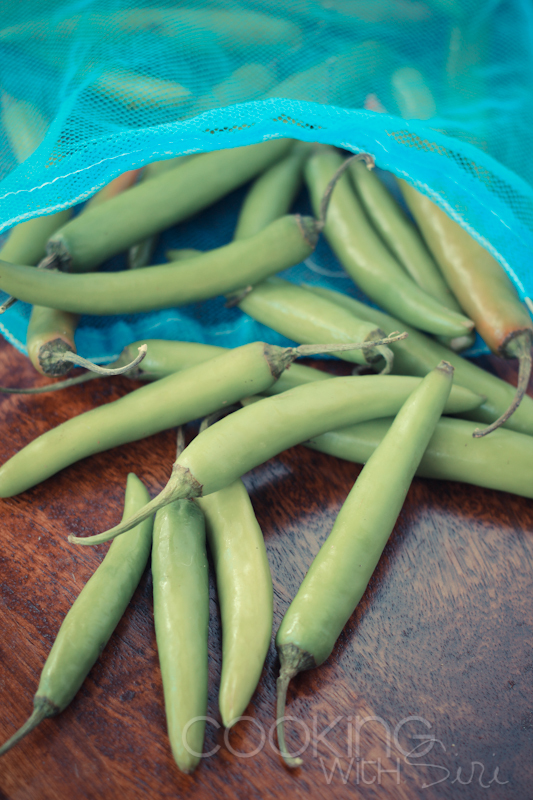 Yum ,yum and super yum, Thanks a ton for sharing all that wisdom from veterans of mirchi bhajji trade! And Happy Pongal to you! I am hooked on the pics. Would love that with some hot tea..! I am hosting my first blog event plus giveaway – Valentines Special. Do check it out and be a part of it. Would be great..! Wish you a happy Sankranthi Too! Cut Mirchi is my absolute favorite. Looks crispy and very tempting to me. Looks so good... Just what I need right now in this cold Bangalore weather. Oh god Siri mouthwatering , we get this at peacock here and he sprinkles with red onions and chat masala and drizzle with lemon. My Second Visit to Vaidehi Ashram..